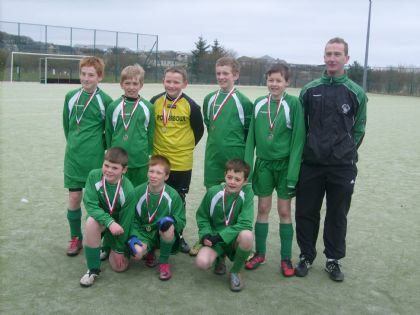 The outdoor youth football season was brought to a conclusion at Picky on Saturday and Sunday with the annual under 12’s competition with visiting Shetland sides, Lerwick Rangers, Ness United and Scalloway. 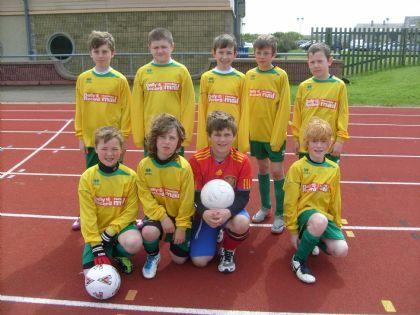 The competition was split into an “A” league and a “B” league with 3 Orkney and 3 Shetland teams competing in each league. Conditions were difficult on the Saturday with continual rain falling during the day’s play. Sunday was a much better day with sunshine and a stiff breeze blowing although the previous day’s rain had made ground conditions heavy. Despite the conditions the tournament turned out to be one of the closest fought and most exciting competitions for a number of years particularly in the “A” league where any one of five teams could have ended up winning. The tightness of this league was reflected in the low scoring matches with 9 out of 15 matches ending as draws or single goal victories. The outcome was still in doubt as the final match was played with Thorfinn A needing to win by 3 clear goals against Scalloway but a late Scalloway goal in a 3-1 defeat ensured that at the end of the competition there was nothing to separate the Thorfinn A team and Ness United A from Shetland, as both teams ended up with an identical record including goals scored and goals lost. It was then onto the dreaded penalty kick shoot out to decide the winners and it was Thorfinn who scored the final decisive penalty to narrowly edge out the Shetland visitors by 3-2. East Utd A also ended up with 9 points but having lost to the two other top teams, they were placed third. 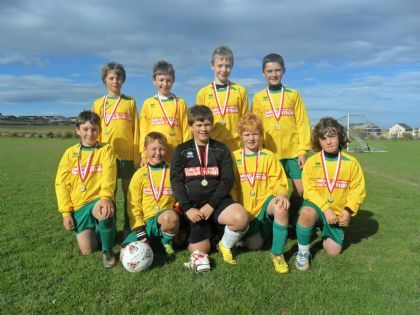 The B league also went to a winner takes all final match decider between Stromness and Thorfinn B. 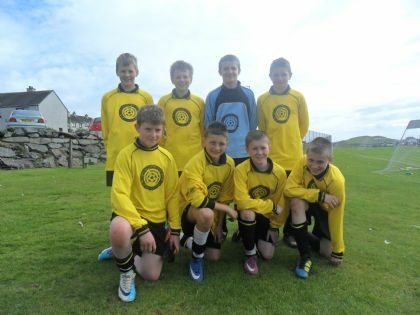 The young Stromness team had looked impressive throughout the competition and they confirmed their favourites tag when they convincingly beat the Kirkwall side 5-1. 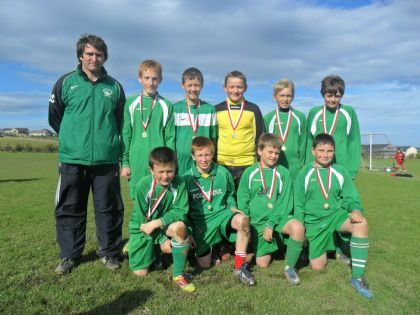 The future looks very promising for the Stromness team and they look destined for more success in future competitions. At the end of the competition Jim Cormack OYDG Chairman thanked all those who had helped make the competition such a success, in particular the visiting teams from Shetland. He commented on the excellent quality of football played in the challenging conditions and he also thanked the referees, Picky staff, and Cafelolz@21 for providing the hospitality for the visiting teams. Jim then presented winners medals to the two winning teams. This was an excellent competition to end the season and great credit is due to all the teams for performing so well over the two days, and particularly during Saturday’s downpour. 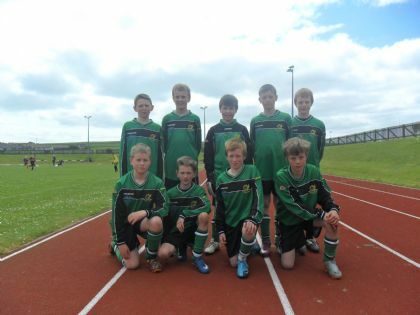 On Saturday 20th August Orkney U13`s travelled overnight on Northlink to Shetland. On Sunday morning the boys had breakfast on the boat then headed to the Clickimin Centre where the U13s were invited to play in the local U14 club cup competition. 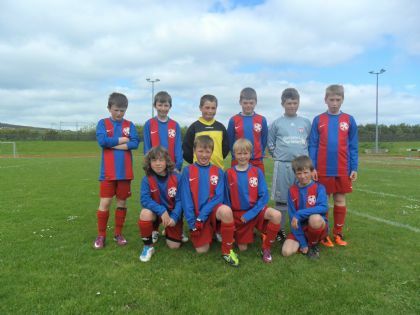 In group two the east side won all their games to go into the semi finals as group winners. In the semi the East boys never had a chance as whenever they moved the ball forward they were pushed of the ball without a free kick being awarded much to the frustration of the players and coaches. Eventually the East players lost their discipline and the game 3-0. More concerning for the coaches was the injury to Liam Delday which meant he had to sit out the rest of the weekend and miss the main county game the following day. Orkney East pictured in Lerwick. 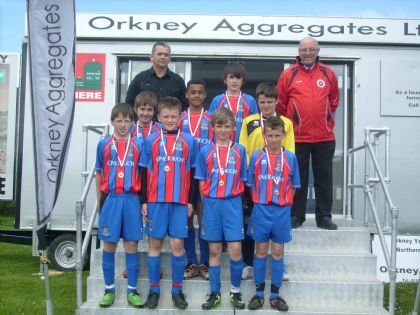 Saturday saw the annual Northern Counties Under 12’s 7-a-side competition sponsored by Orkney Aggregates held on the Picky Infield. With Inverness Caley Thistle sending two team along with the best teams for Orkney, Shetland and Caithness the standard of football was high. 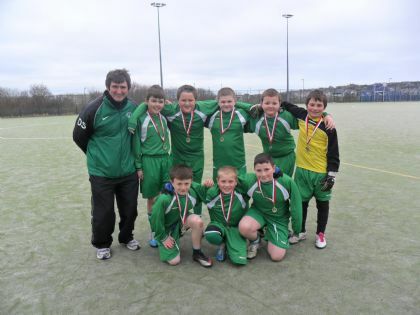 Conditions for football were good as ten teams kicked off in two groups. As the competition progressed the odds were increasingly on a repeat of last year’s competition with both Caley Thistle teams looked unbeatable as they won their early games. 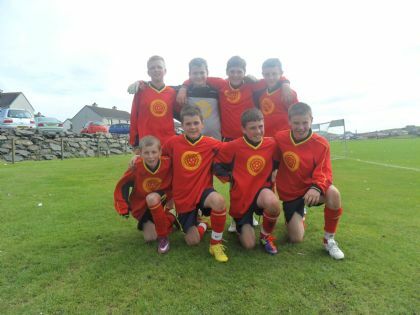 In Group 1 the main competition to Caley Thistle was presented by Orkney’s top team, the Orkney Reds and they played each other in the first game. Whilst Caley Thistle deserved their victory, Orkney will be disappointed with the fact that the only goal of the game was due to an defensive mistake that could have been avoided. Whilst Orkney recovered to win their other three games the defeat against Caley proved decisive and they finished second in the group behind the Inverness team. 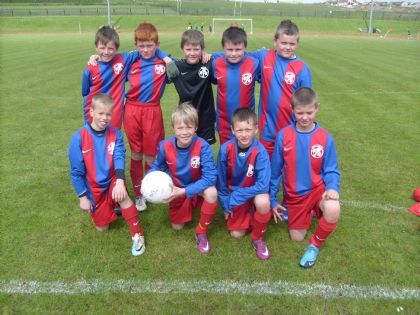 Caley Thistle also looked to be heading to victory in Group 2 as they won their opening three games convincingly, but in their final match they faced Shetland Blue who also remained undefeated. Whilst a draw would have been sufficient for Caley to top the group it was Shetland who took the lead in the match. Caley piled on the pressure but the Shetland Blues held out for a narrow victory and claim an unexpected final match against the other Caley team who had won Group 1. The final turned out to be a one sided affair as Inverness showed their class and cruised to a 6-0 victory over Shetland Blue. For the second year in a row Caley Thistle have won this competition but credit to the Shetland boys for overcoming the second Caley team and making it to the final. 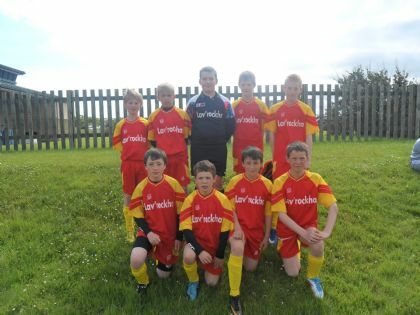 The Orkney coaches were pleased with the performance of the Orkney boys with the Reds competing well in Group 1, and in the second group the Orkney Wine composed of Under 11 players competing very well against the older boys and only losing one match against Caley Thistle. Following the tournament Jim Cormack OYDG Chairman thanked the visiting teams, referees, Picky ground staff and the sponsors Orkney Aggregates. He then introduced Jimmy Harcus representing the sponsors who presented medals to the winning Caley Thistle team. OYDG are grateful to Orkney Aggregates for their continued sponsorship of this prestigious competition. 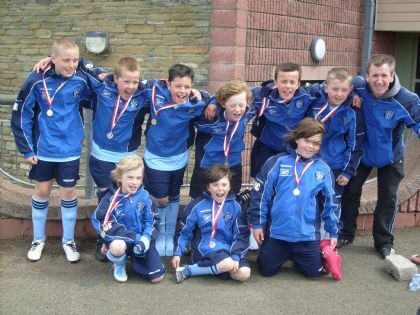 A blustery and cold morning saw five teams - three from Orkney and two from Shetland play in a very competitive Under 11's competition at Picky on Saturday morning (28th May). The intital games pointed to a very close competition and so it proved with eight of the ten matches played ending in single goal victories or draws. Credit to all the teams who coped with the windy conditions well and played very good football as the league progressed. In the end it was the Shetland Sky Blue whe emerged victorious being the only team to emerge with an undefeated record winning three games and drawing one. Orkney Green 0 Shetland Navy 1; Orkney Wine 0 Shetland Sky Blue 0; Orkney Green 1 Shetland Sky Blue 2; Orkney Yellow 2 Shetland Navy 0; Shetland Navy 0 Shetland Sky Blue 2; Orkney Wine 1 Orkney Yellow 2; Orkney Yellow 2 Shetland Sky Blue 3; Orkney Wine 1 Orkney Green 1; Orkney Green 2 Orkney Yellow 1; Orkney Wine 0 Shetland Navy 1. The OYDG outdoor season kicked off on a bitterly cold morning on Saturday 26th March at the Picky All Weather Pitch with the annual club competition to coincide with the visit of Whitedale from Shetland. In total ten teams played in the Under 12’s competition which was split into an A League and a B League including two Whitedale teams. Dounby A 1 East United A 0; Stromness A 0 Thorfinn A 2; Whitedale A 1 Dounby A 1; East United A 4 Stromness A 0; Thorfinn A 3 Whitedale A 1; Dounby A 2 Stromness A 0; East United A 2 Whitedale A 0; Thorfinn A 1 Dounby A 0; Stromness A 1 Whitedale A 1; East United A 1 Thorfinn A 1. At the presentation OYDG Chairman Jim Cormack thanked all those who had helped make the competition such a success, in particular the visiting team from Shetland and we look forward to seeing them again next year. He introduced Whitedale coach Steven Morgan who returned the thanks and commented that the annual trip to Orkney was the highlight of their club calendar. Steven then presented medals to the winning Thorfinn teams. At the end of the competition the Whitedale coaches select their choice for Orkney player of the tournament and generously present a trophy to the winner. 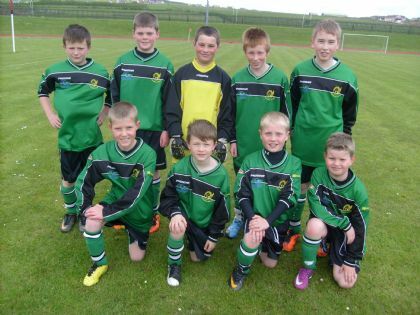 This year they selected Sam Hunter of Stromness A – well done Sam. 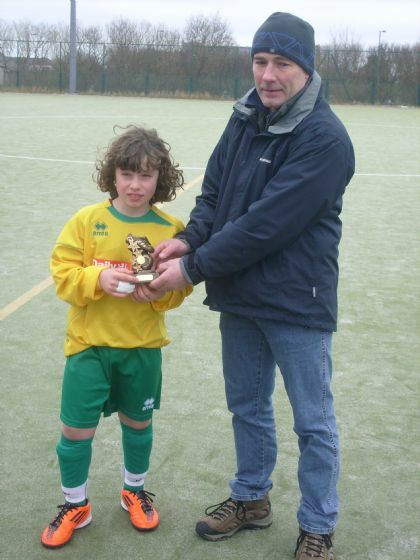 Whitedale coach Ivan Sinclair presented Sam with the trophy.